This article is a beginner's tutorial for understanding what is ADODB. ADO (ActiveX Data Object) is Microsoft's advanced universal data-access solution, consisting of an object model-based. 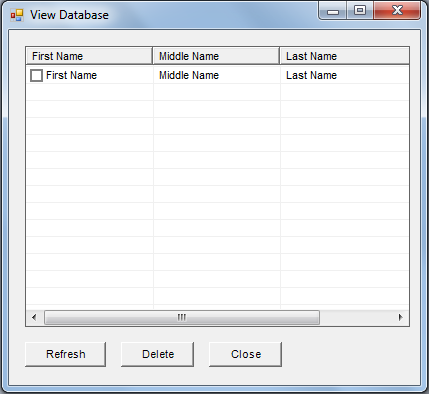 ActiveX Data Object, which is a technology that allows data-access functionality to different types of data sources. For your understanding of this code you will need to install VB.Net 2005 and you also need MS Access 2003 or higher version. Add new reference by click on Project>Add Reference >COM > and Add Microsoft AciveX Data Objects 2.6 Library. 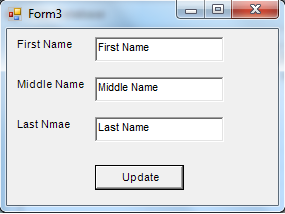 1) Create 3 Form i.e Form1,Form2,Form3. 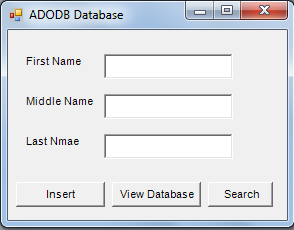 5) Create MS Access Database "Database1.mdb"
6) Create a table "ADODB"
7) Create 3 field FirstName, MiddleName, LastName and Rename ID field to SN. Constr = "Provider=Microsoft.Jet.OLEDB.4.0;Data Source=" & My.Application.Info.DirectoryPath & "\Database1.mdb;Persist Security Info=False"
strSql = "insert into ADODB (FirstName,MiddleName,LastName) " & " values('" & Text1.Text & "','" & Text2.Text & "','" & Text3.Text & "')"
1) Place ListView from Toolbox. 2) Add 3 column by using columns properties of ListView. i.e 1)First Name 2)Middle Name 3)Last Name. Place 3 Button Refresh, Delete and Closed respectively. Write down following code in Form2. 2) Place 3 Text Boxes.